This unexpected pepper weevil traveled inside a jalapeño from Mexico giving me a surprise winter subject. I was thrilled to find this inadvertent visitor in a pepper a couple months ago. Arthropod subjects are typically rare for me during the cold months; even house spiders don’t seem to show themselves much. 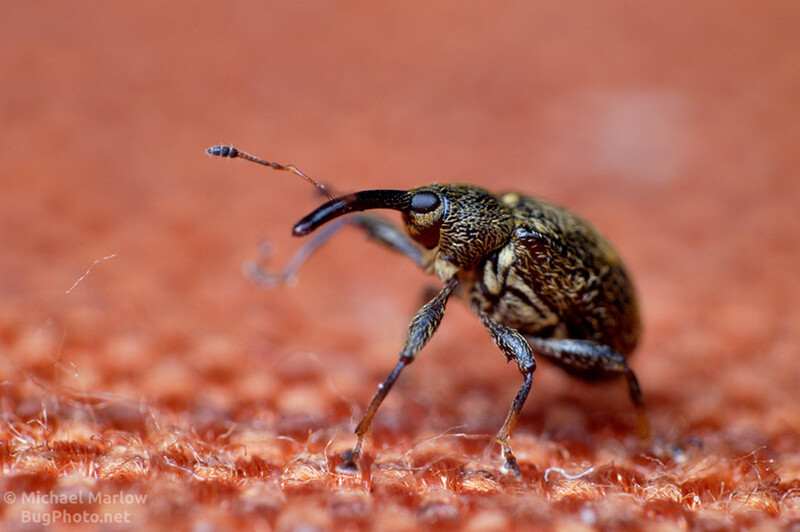 The pepper weevil provided a good opportunity to test out my newly constructed DIY flash diffuser. My approach to bug photography usually requires flash output to freeze all the little movement of our little friends. In turn this requires a way to soften the light so it doesn’t overwhelm the shot. Unlike a lot of photography equipment, a diffuser can be had for very cheap using common material such as tape, soda cans, packing foam and common plastic containers (I’m looking at you water jug). Many photographers more accomplished than I have come up with their own designs, and I have taken cues from those and will hopefully take some more in perfecting a set up. Below is the evolution of my DIY diffusers. The first two pictured are simple plastic container lids that I found useful with the not entirely convenient on-board flashes I relied on; the smaller one was from way back (or so it seems!) when I used a point and shoot (Canon A620); the bigger one I used when I first acquired my D5000. They worked well enough, but shiny subjects produced harsh glare spots. These next shots show a soda can diffuser, after LordV’s design. I’ve used this one since I obtained the Nikon Speedlight SB-600 hotshoe flash. I’ve been fairly happy with it, but I still get some harsh glare that I’d like to improve on. Part of the problem is, I believe, that the combination of the SB-600 and the bracket I use does not position the flash close enough to the subject. I am hoping to remedy this soon with some simple, cheap equipment. This next monstrosity is what I used on the weevil shot. It was more or less an off-the-cuff, messing around design. I was hoping to spread the light across both sides of the subject, but I’m not sure that really happened. I can’t complain too much, as the light is fairly even on the weevil. On a shiny porcelain figurine (not pictured here) it didn’t really test out much better than the coke can diffuser. It also failed to stay in place on the camera and was not well-executed as far lining up the flash. Given the unwieldiness of it, it probably will be retired early. It was fun to do a little “mad” “science,” though. Late ADDITION: I decided to add these really quickly (no post-processing to speak of), shots of the porcelain figure I alluded too above. My monstrous diffuser might have worked out a little better than I thought (coke can diffuser on the left, shoebox diffuser (ha) on the right). If you’re looking for some great ideas, there are many great photographers out there who share their diffuser designs (as well as their complete shooting set ups). Ted McRae has a good comparison and discussion of the diffusers he uses at his site, Beetles in the Bush. And Alex Wild just posted a nice summary of his flash diffuser set up on his Scientific American blog. I also recommend checking out John Hallmén’s photos on flickr as well as his YouTube video (one of which he posted recently where you can get a good sense of his set up). I also really need to do a search for “concave flash diffuser,” a method I have put off too long to investigate. Those are just a few really good insect photographers from whom we can learn a lot; as I said, there are definitely more out there. As for me, hopefully I can find a better solution; improving my use of flash is definitely an area where I can improve my photographs. I am looking forward to the challenge. Posted in Photo Gear, WeevilsTagged Anthonomus eugenii, beetle, DIY flash diffuser, flash photography, Macro Photography, pepper weevilBookmark the permalink. Thanks for the double diffusion tip; it’s definitely something I will try. Blocking too much light was very much a concern with the shoebox; a lot of the shots of the weevil were underexposed because my regular flash output setting wasn’t high enough; I didn’t really notice it until I had them on my computer screen. That also kind of dampened my enthusiasm for the design (it brought on the thought of carrying around a dozen or two AA batteries in my bag!). I’m going to have to fine tune it a bit. Competing interests really is the name of the game. The more I learn about photography, the more I think one could sum it up as just that. Thanks again for the comment; I also really like your website. Great photos and very informative; I’ve learned quite a lot reading it! Call Me Ishmael. Better yet, call me Morgan Freeman.